Southland track sprinter Matt Archibald will make his World Cup debut early in the new year. Less than four years after he attended his first national cycling championships, the former rower will head to Beijing in January to try to push his claims for a place in the New Zealand team for the London Olympics. BikeNZ sprint coach Justin Grace said Archibald would be putting pressure on the more established members of New Zealand's burgeoning sprint programme. "It's his first World Cup and he's going there to get the experience of the World Cup programme and the experience of racing in the international scene, but certainly his main objective going there is to ride as No1 for the team sprint and it's his opportunity to put his hand up and say `I'm still in the running for the Olympic team'," Grace said. 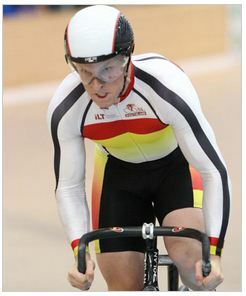 Archibald's main competition for a place in London is Ethan Mitchell, a silver medallist at last year's Commonwealth Games in Delhi, as the lead-off rider in the team sprint. He will ride with Invercargill training partner Eddie Dawkins, who will also ride the keirin, and Simon van Velthooven in the team sprint in Beijing, and contest the individual sprints. "For the other guys, they are going there to support Matt with his thing of starting that team sprint fast and collecting some good Olympic points for the team," Grace said. Mitchell and Sam Webster are being given a break from World Cup duties after being part of the team which went to Cali, in Colombia, after the Oceania Championships. That campaign ended in disappointment when Webster rolled a tyre and brought Dawkins down during qualifying. "The guys are very, very professional for a young bunch of guys," Grace said. "They have taken [the crash] in their stride ... They were obviously very disappointed that we didn't get to post a time there because we were on track to ride well inside the best time by a New Zealand team. Not getting those Olympic points hurt but it happens in racing and they have moved on already." A scaled-down sprint team will take part in a camp in Invercargill's now unnamed velodrome. The venue's previous sponsor, the Invercargill Licensing Trust, agreed to have its signage taken down recently in return for businessman Louis Crimp – a long-time antagonist – contributing $2 million to the Stadium Southland rebuild. With van Velthooven training in Australia at the moment, Archibald and Dawkins will be joined by the women's sprint team of Natasha Hansen and Katie Schofield. A $200,000 funding boost from Sparc has added to the momentum already created by the progress of Hansen and Schofield as they make a late bid to qualify for London. Beijing loomed as an important date for the women's programme, Grace said. "It will determine the future of this season's World Cup programme for them a little bit. They need to get some pretty good points there and at the London World Cup to make the step up to qualifying for the Olympics. For them it's a pretty important race." Although New Zealand's sprint programme had originally been built towards the 2016 Olympics, Hansen and Schofield were on the same steep arc as their male equivalents, Grace said. "They are 2016 prospect athletes. There's still a very good chance that they will be able to qualify a team for the Olympic Games. However it's totally up to the NZOC as to where they deem them in their careers and on the world stage. Certainly we are looking at 2014 and 2016 as a programme for the girls." Like Archibald, Schofield will be making her World Cup debut in Beijing, having first ridden at a competitive level with Hansen at the Oceania championships. "She will be getting to race for the first real time at a high level in tactical events," Grace said. The New Zealand team will also have a presence in the endurance events at the January 13-15 Beijing World Cup, consisting mostly of riders who missed out on Cali.